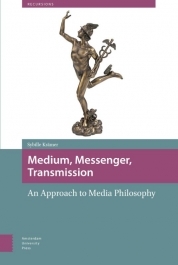 Sybille Krämer’s Medium, Messenger, Transmission: An Approach to Media Philosophy is the first book in our new book series Recursions (Amsterdam University Press). The influential book that represents one significant strand of so-called German media theory is translated by Anthony Enns and is now available! Enns has also written a very good introduction to the book that offers a context in which to understand Krämer’s impact in the field of media theory and media philosophy. Her work has over the years addressed philosophy of technology, cultural techniques and processes of formalisation in mathematics, as well as themes relating to artificial intelligence, language and rationalism. Krämer is interested in how a focus on the technical apparatuses is not sufficient for us to understand the wider field in which media works – she is interested in mediality. Krämer’s take on media philosophy introduces different models for such medial operations of transmission and messaging. “(1) A philosophy of mediality can only begin by recognizing that there is an unbridgeable distance between the sender and the receiver ‒ a distance that can never be overcome. (2) The medium occupies the intervening space between the sender and the receiver, and it is able to facilitate their connection while still maintaining the distance that separates them. (3) All forms of communication are reducible to acts of (non-reciprocal) transmission between the sender and the receiver, as unification and dialogue remain impossible. (4) Transmission is an embodied, material process, yet it is frequently understood as disembodied, as the medium is supposed to be invisible through its (noise-free) usage.” (Enns 2015, p.13). viruses, money, translators, psychoanalysts, witnesses, and maps ‒ can be seen as media in the sense that they simultaneously bridge and maintain differences between heterogeneous worlds. The messenger model thus depends on the basic insight that a community of different individuals is founded on the distance that separates them, which precludes the possibility of unification or intersubjectivity, and all attempts at communication are actually acts of transmission, as communication is fundamentally unidirectional, asymmetrical, and non-reciprocal.” (Enns 2015, p. 16). As series editors, we hope that the book will have the wide impact it deserves, being such an important take on fundamental issues that speak to media and communication scholars but also to the wider philosophical and cultural discourse concerning what mediation means. You can find the introduction to the Recursions book series online (Academia.edu) and copied below. Please consider asking your library to order a copy of Krämer’s exciting study! For review copies, you can contact AUP or one of us series editors. Recursions: Theories of Media, Materiality and Cultural Techniques is a book series about media theory. But instead of dealing with theory in its most classical sense of theoria as something separate from practice that looks at objects and phenomena from a distance, we want to promote a more situated understanding of theory. Theory, too, is a practice and it has an address: it unfolds in specific situations, historical contexts and geographical places. As this book series demonstrates, theory can emerge from historical sources and speculations still closely attached to material details. We therefore speak of the recursive nature of theory: It is composed of concepts that cut across the social and aesthetic reality of technological culture, and that are picked up and reprocessed by other means, including the many media techniques featured in this book series. The recursive loops of theory and practice fold and define each other. The genealogies of media theory, in turn, unfold in recursive variations that open up new questions, agendas, methodologies, which transform many of the humanities topics into media theory. techniques serves to conceptualize how human and nonhuman agencies interact in historical settings as well as to expand the notion of media to include the many techniques and technologies of knowledge and aesthetics. This expansive – and yet theoretically rigorous – sense of understanding media is also of great use when considering the relations to biology and other sciences that deal with life and the living; another field where media studies has been able to operate in ways that fruitfully overlap with social studies of science and technology (STS). Overall, the themes emerging from the Recursions book series resonate with some of the most interesting debates in international media studies, including issues of non-representational thought, the technicity of knowledge formations, and the dimensions of materialities expressed through biological and technological developments that are changing the vocabularies of cultural theory. We are interested in the mediatic conditions of such theoretical ideas and developing them as new forms of media theory. Over the last twenty years, and following in the footsteps of such media theorists as Marshall McLuhan, Friedrich Kittler, Vilem Flusser and others, a series of scholars working in Germany, the United States, Canada and other countries have turned assumptions concerning communication on their head by shifting the focus of research from communication to media. The strong – and at times polemical – focus on technological aspects (frequently referred to as the ‘materialities of communication’) has since given way to a more nuanced approach evident in appellations such as ‘media archaeology’ and ‘media ecology’. These scholars have produced an important series of works on such diverse topics as computer games, media of education and individuation, the epistemology of filing cabinets, or the media theories underlying the nascent discipline of anthropology at the end of the nineteenth century, thereby opening up an entirely new field of research which reframes our understanding of media culture and the relationship be tween media, culture, politics, and society. In other words, these approaches are distinguished by the emphasis on the materiality of media practices as well as the long historical perspectives they offer. A major part of the influences of recent years of media theory, including fields such as software and platform studies, digital forensics and media ecology, has been a conjunction of German media theory with other European and trans-Atlantic influences. The brand name of ‘German media theory’ commonly associated with, though not restricted to, the work of Friedrich Kittler – is a helpful label when trying to attempt to identify a lot of the theoretical themes the book series addresses. However, we want to argue for a more international take that takes into account the hyphenated nature of such influences and to continue those in refreshing ways that do not just reproduce existing theory formations. We also want to challenge them, which, once again, refers to the core meaning of recursions: variation with a difference. Reblogged this on News, Technology and the Individual.